Track Saw vs Table Saw: Which One to Choose? Track saw or table saw? This is not always an easy question to answer, especially when you’re shopping online. While there is a lot of overlap between these two tools, there are some fundamental differences you should consider when shopping so that you get the kind of tool that best suits your needs. Track saws feature a saw much like a circular saw but designed to run down a track. The first benefit of this is that you ensure you get a perfectly straight cut—no more trying to follow a penciled-on line freehand. The second benefit is that the wood doesn’t have to move while you make the cut, meaning that many people will feel more in control of the cut. Table saws work by running the wood past a stationary blade that emerges from a table. Instead of moving the blade, you move the wood past the blade. This means that you’re not limited by the length of the track, as you would be with a track saw. It also works better for cutting lumber, since you don’t have to set up a track to do a short cut. Where these machines differ is where they excel at making cuts. Track saws are generally better for making cuts that are along the outside of a sheet of plywood because the weight will be focused on the outside of the board. If you try to cut down the center, first you have to come up with some kind of support system that allows your blade to run free underneath, and second, the weight is going to be concentrated in the middle, and you run the risk of pinching the blade between the two halves of the board. Table saws are great for making cuts down the center of plywood boards or lumber, as you can put pressure on the outside of the board as you move it across the blade. In fact, it’s the only way to use that kind of machine. If you’re making a cut close to the outside of a plywood sheet on a table saw, odds are you’ll need to go extra slowly to get a good, straight cut. Those kinds of cuts would be easier on a track saw. Overall, it’s important to note where the majority of your cuts are taking place. If you aren’t sure, then the table saw is generally a safer bet, as it is good for more kinds of general cuts. The Makita SP6000J1 is our favorite track saw. Featuring a powerful 12-Amp motor, it will cut through even the hardest woods with ease. Other models with this much power might have trouble with lighter woods, and end up going too fast, but this track saw comes with electronic speed control, which keeps things running smoothly. It can cut up to 2-3/16” deep at 90 degrees, but also comes with the ability to cut at angles up to 48 degrees, where it can cut up to a depth of 1-9/16”. It also features depth adjustment, allowing you to do preliminary or partial cuts. The guardrail is 55” long, giving you the length you’ll need for most projects. Most people aren’t going to be doing angled cuts on this saw, but if you are, be aware that you may need to double check the angles, as they may not be calibrated straight from the factory. The WEN 36055 is our choice for best for the money. It features a good motor that provides 9 amps of current, which isn’t as strong as the previous model, but still respectable. Though it has a weaker motor, it can cut just a bit deeper at angles than the previous model, 2-5/32” at 90 degrees, but 1-5/8” at 45 degrees. It comes with two 27.5” tracks which can be used together to create a 55” rail. One downside to this model is that it comes with one track connector, and many people feel more secure when using two. One of the best things about this model is that it comes with 1 ½” dust port capable of rotating 360 degrees, which means you can hook it up to a 1 ½” tube leading to a shop vac. This makes cleaning up far easier and can save you a lot of time. The one downside is that dust that doesn’t get picked up has a habit of ending up down in your track, which can be a pain. Overall, this model provides good power and a ton of features that you would only expect in more expensive units. The Shop Fox W1819 is our top choice. It features a 3-hp motor that is powerful enough to tear through any project. Not only is it powerful, but it’s also safe. A clear polycarbonate guard allows you to see the blade throughout the cut, and a riving knife prevents kickback that’s a common source of injury. It’s always nice to have a powerful saw. It’s even better to have one that’s powerful and safe. If you have to assemble this machine alone, don’t worry. It’s easy-to-assemble right out of the box, even for one person. The dust port also works well, funneling most of the dust away from the working area. The one downside is the poor-quality miter gauge. Cheap miter gauges are common, but it would have been nice to get a better one. That being said, most people end up upgrading theirs anyway. 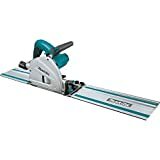 Overall, this is one of the best table saws on the market. The DEWALT DWE7491RS is our choice for best for the money. This is a saw designed with construction work in mind, which means that it’s extremely portable. If you’re looking for something to sit in one place in your shop, this model will work fine; it’s just that you’re missing out on its best feature. It comes with a rolling stand which makes it easy to move around and features extendable legs so that you never have to use it on the ground. Given how easy it is to move, it’s a bit surprising how powerful the unit is. The 15-amp motor is strong enough to complete any job. The dust port is also up to the task and is especially good for when you end up working inside. The table is a bit below-average in size, but it features an expanding rack and pinion miter gauge system that allows for rips up to 32½”. Some people will end up upgrading the miter gauge, as it is lower-quality than many would like. Despite this, you’d be hard-pressed to find a better, more portable, table saw than this one. The Makita SP6000J1 is our favorite track saw, featuring the most power, electronic speed control, a great track, and high-quality depth adjustment. The WEN 36055 is the best for the money, possessing good power and a great dust port at a fantastic price. The Shop Fox W1819 is our top choice for table saw, due to its power, ease of assembly, great dust port, and excellent safety features. 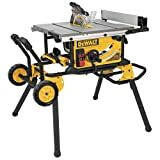 The DEWALT DWE7491RS is the best table saw for the money, in large part due to its unparalleled portability. Hopefully, we’ve helped you figure out whether you need a table saw, or a track saw. It’s not always easy to shop for tools online, but we’ve done the hard work for you so that you can buy the tool you need with confidence.